The company was originated in name of "RAMA ENGINEERING STORES" by Late Darshan Dhingra in 1963 with a Seed Shop sooner started with the distribution of Kirloskar Pumping sets and agricultural based equipments. 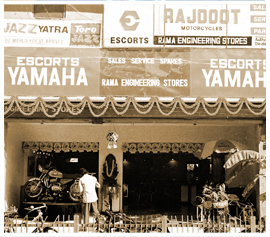 In 1975, the first luxurious hotel in heart of city was launched in name of " AMBAR HOTEL" and the agriculture equipments were added with the Escorts Tractors and later on converted in to Two Wheeler in 1984 with Escorts "RAJDOOT" adding to" YAMAHA" Motorcycles into the Sales, Service and Spares. The Dealership was awarded for No.1 Sellers of Rajdoot Motorcycles in India and No.1 sellers of Yamaha Motorcycles in Uttar Pradesh for 3 consecutive years. In the Year 1989, the young entrepreneur Mr. Rajeev Dhingra joined the family business with new vision and mission. 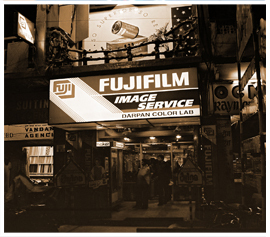 Apart from the family business, he started the concept of Photo Printing through Photo Mini Labs for the first time in Eastern Uttar Pradesh at Gorakhpur in name of "DARPAN COLOR LAB". 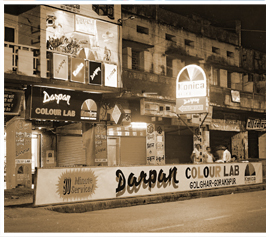 In 1996 Darpan spread its wings by opening the Photo Lab at Azamgarh and Deoria in 1999. Recognizing the widespread penetration of Internet technologies into the business and consumer base & reinventing a need for new and innovative solutions to serve these markets better. "VIDHI INFOTECH" was launched in the year 2000. The vision of Mr. Rajeev Dhingra along with wife Mrs. Shruti Dhingra approached to new heights by placing the First Digital Photo Mini Lab of Uttar Pradesh in the year 2002 and adding another unit at DELHI in 2005. In the year 2006 the YAMAHA dealership was converted to a franchisee of Readymade Garment showroom as the poor performance of YAMAHA sales across India. February 24th, 2010, the legend Sri. Darshan Dhingra left this earth assuring responsibilities on shoulder of Wife Mrs.Naresh, son Rajeev and Daughter In-law Shruti. With the present scenario and customer needs Hotel Ambar was restructured in memory of Late Darshan Dhingra and opened for public on 16th May, 2010 with a new name & Fame "ROYAL RESIDENCY HOTEL" followed with "Shahanshah" first theme based restaurant on the mega star Amitabh Bachchan, "Darsh-Naresh" The Banquet, "Odeon" A Celebration place, "Mantrana" A multipurpose place for conferences and small gatherings, "Hukka Lounge" go zing, and "Vishraam" the spa and massage centre. Newest addition to the team, Raksh an Honours Graduate in from the country's best B - School in Hotel Management IHM - Aurangabaad. Raksh also happens to be third generation in the family business and young blood the organisation needed to set the tone for future. He has already contributed handsomely to the business by launching "Shahanshah - Taste me Baap" marking his arrival in the company. For the last Four decades, the company has been providing the Indian Market with a range of high quality services and a strong distribution network. The year 2017, turned out to be one of the most prolific financial years in the history of the company wherein, the company crossed international borders and took over Bath and Tile (NZ) Ltd. one of the most prestigious business in Industry of Bath and Tile fittings in Auckland, New Zeeland. With two showrooms in Auckland (Albany and Manukau City) don't just present attractive bathrooms, they also allow you to soak up the experience of a real bathroom as it would appear and function inside your home. As sole suppliers in New Zealand of our feature brand AMBIENCE, we offer a portfolio of remarkable products that match and complement a range of design styles.